Award-winning author Billie Livingston has once again used her crisp clean prose to deliver another compelling story about an at-risk teen coming to terms with the severe limitations of her once-idolized grifter parents. As in the author’s first novel Going Down Swinging and her collection of short stories, Greedy Little Eyes, there are no silk blouses or cashmere sweaters in One Good Hustle. Livingston spins a humorous gritty tale set in the Vancouver suburb of Burnaby in the mid-80s that is both gripping and realistic. Sixteen-year-old Samantha Bell (Sammie) leads a precarious life through no fault of her own. The daughter of two small-time hustlers, Sammie leaves home after a number of her mother’s alcohol and drug-induced episodes and ramblings about suicide. The victim of a hustle gone wrong, mother Marlene spirals out of control until Sammie finally seeks refuge at the home of high school friend Jill, whose working-class parents are caring and stable, something that Sammie finds both foreign and comforting. Sammie’s relationship with her own con artist father is equally as troubled, particularly when she is forced to see that he put her in harm’s way for the sake of a heist. Confronting her long-cherished beliefs about her parents, Sammie experiences intense feelings of disappointment, shame, betrayal and hope, a highly vulnerable situation rendered beautifully by Livingston in this coming-of-age novel. The author has delivered a well-rounded character in Sammie. Still a street-smart teen able to see a potential hustle, which she uses to finance her driver’s ed classes, Sammie nevertheless remains drug and alcohol-free as a means to maintain what little control she has over her own life. She is also determined to finish high school, no small feat given her limited stability and guidance. Sammie’s life is anything but carefree, which Livingston expertly illustrates through the use of her friend Jill as a foil. Average teen Jill goes to bush parties and naively dives into a doomed romance, whereas Sammie finds the prospect of a relationship a highly stressful undertaking, a luxury she simply cannot afford. Sammie keeps love-interest Drew at arm’s length for fear that his wealthy Christian family will discover the truth about her past. But Sammie has a lot of tracks to cover, which causes further turmoil. When Drew moves too close, Sammie physically strikes out, and this minor incident is what makes One Good Hustle so resoundingly real. As a young woman with few socially acceptable means for venting anger and frustration, Sammie suffers in silence, internalizing her feelings. Her lashing out in the face of mounting stress makes her character all the more credible and gives the reader a well-deserved break from the passive heroine so widely flogged in mainstream media. Last year, in an interview with Billie Livingston on her YA novella taken from One Good Hustle, I asked her about the origins of Sammie’s character. She told me that in addition to drawing on family members and girls she had gone to school with, Livingston had grown up with many small-time hustler families like the Bells. It is perhaps the author’s first-hand knowledge of this milieu that makes this novel ring so true. One Good Hustle will remind many of us not only of those dark days when we feared becoming our parents but also of just how trying those teen years can be. Many young readers will find validation for their own experiences in the book, particularly those who are marginalized and who rarely find anything resembling their own reality on the pages of a novel. Livingston has once again given us a stellar book about people we see every day on the street but rarely ever meet. This review has been cross-posted at Rover Arts Uncovered. 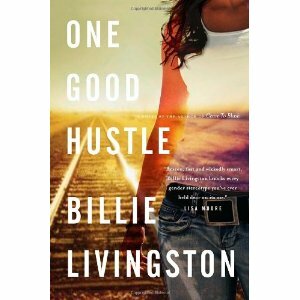 : Summer Reads: One Good Hustle by Billie LivingstonTweet this!